The exhibit as opened, the installation is complete! 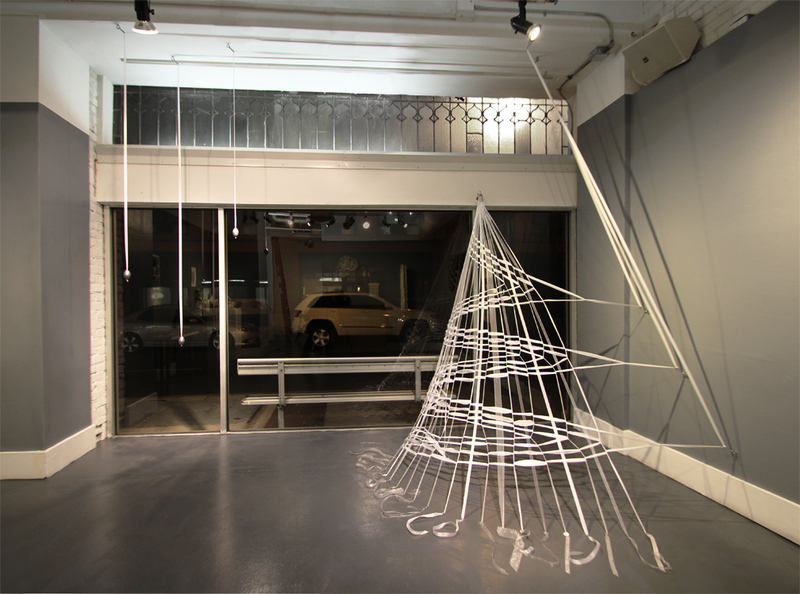 here is an image of “Drawn Out”, 10′ X 13′ X 7′, Ribbon, Lead, Carabiners and Steel, 2013. Three lead weights create a tensile force on the horizontally woven ribbons; this force helps to shape the main volume of the piece. The counterweights are connected to the main form by satin ribbons strung through a series of carabiners, mounted on the ceiling and the wall, that redirect the tensile force created by the lead weights. Curator Jeff Bergman wrote this on his blog “Atlas”. I am experimenting with how dancers can participate in the construction of one of my woven ribbon installations by helping to build a work as part of a performance. I am inspired in part by the tradition of the maypole dance in which textiles are woven around a pole as the risidual creation of a movement performance. Due to limitations in time and budget for this round I have been working on developing structures that two dancers can create. The vertical “struts” are fixed prior to the performance and facilitate this strategy. In the early fall, while the weather was warm, I worked for a few sessions with choreographers and dancers Polly Motley and Hanna Satterlee at a proxy site in East Montpelier to see how we could integrate dance into the construction of the work. 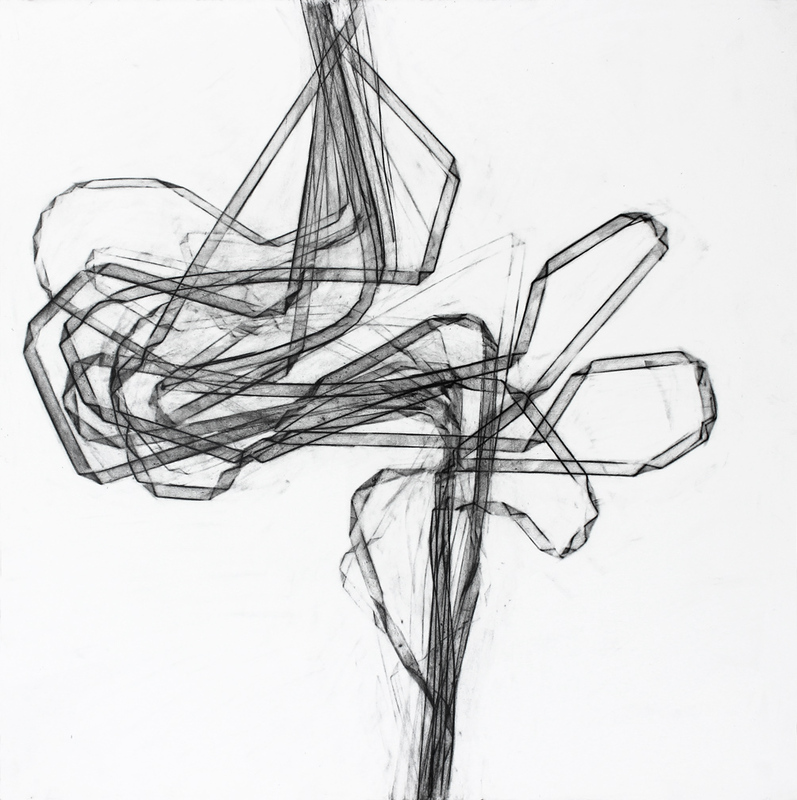 I had developed woven structures for this piece through models and full scale studies. Taking into account the needs and input from the dancers, we changed the woven form they build so as to allow for a broader scope of movement and movement that the dancers enjoy. 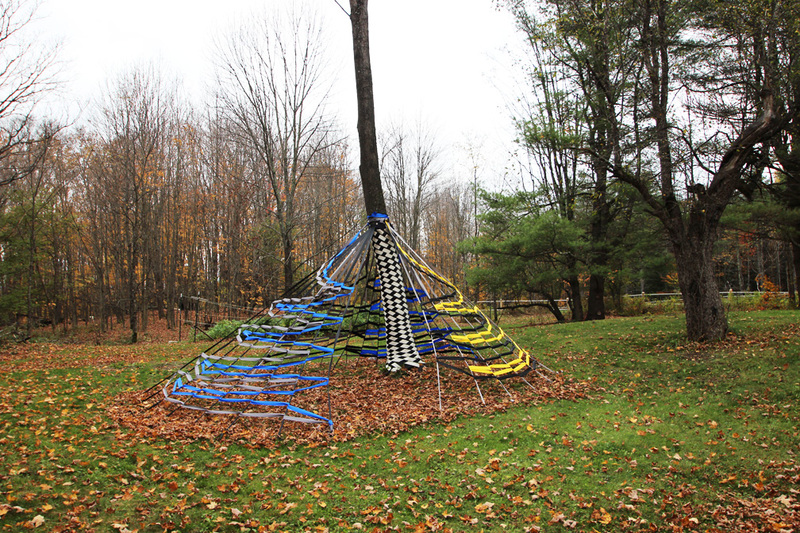 Originally I entended dancers to also construct this form around a tree. However, I discovered that I could build the work as one person working on my own. Perhaps in the future I will have the chance to explore with dancers how to collaborate in creating this work or one based on it. The research and early development of this new body of work has been supported by grants from the Vermont Arts Council and the Vermont Community Foundation. My heartfelt appreciation!